Myanmar's Aung San Suu Kyi is facing mounting international pressure for her handling of violence in Rakhine state and the Rohingya refugee crisis. 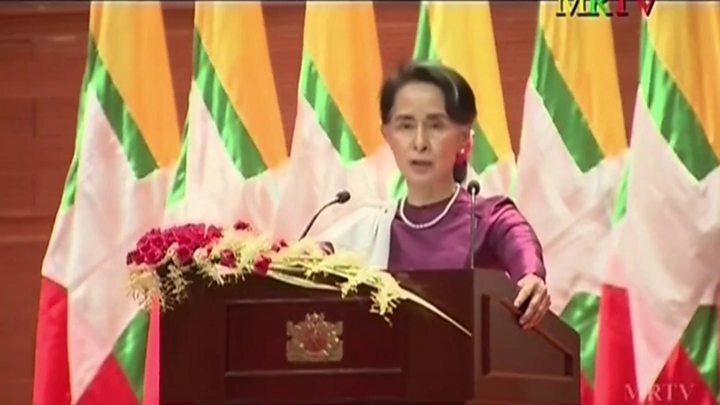 In a speech on Tuesday, Myanmar's de facto leader condemned rights abuses but did not blame the army or address allegations of ethnic cleansing. Leaders and diplomats from several countries have since expressed strong disappointment with her stance. More than 400,000 Rohingya have fled to Bangladesh since late August. The latest unrest in troubled Rakhine was sparked by deadly attacks on police stations across the state last month, blamed on a newly emerged militant group, the Arakan Rohingya Salvation Army (Arsa). Scores of people were killed in an ensuing military crackdown and there are widespread allegations of villages being burned and Rohingya being driven out. The Rohingya, a mostly Muslim minority, are denied citizenship by the Myanmar government, which says they are illegal immigrants from Bangladesh. It refers to them as Bengali Muslims. that all refugees would be allowed to return after a verification process. Reality Check: Are Suu Kyi's Rohingya claims correct? Who are the Rohingya group behind attacks? The Burmese military says its operations in Rakhine are aimed at rooting out militants, and has repeatedly denied targeting civilians. Witnesses, refugees and journalists have contested this. Late on Tuesday, Bangladeshi Prime Minister Sheikh Hasina renewed her call for Myanmar to take back the hundreds of thousands of Rohingya who have fled to her country. "We have told Myanmar, they are your citizens, you must take them back, keep them safe, give them shelter," she told the United Nations General Assembly in New York. She said the Rohingya were facing an "unbearable human catastrophe". Bangladesh also denies Rohingya have any right to settle on its soil - and has been criticised for not doing more to help in the crisis. In a phone call, US Secretary of State Rex Tillerson told Ms Suu Kyi that he welcomed her statement that refugees would be able to return once verified. But he urged her to facilitate humanitarian aid and "address deeply troubling allegations of human rights abuses and violations", the state department said. Also speaking to the UN Assembly, French President Emmanuel Macron said "the military operation must stop, humanitarian access must be guaranteed and the rule of law restored in the face of what we know is ethnic cleansing". 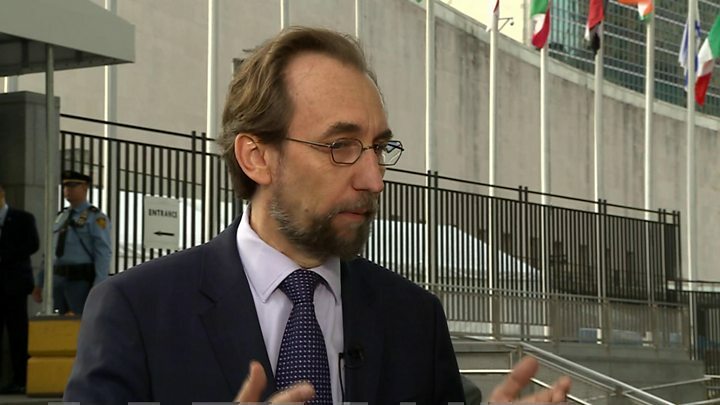 He also said he would start a Security Council initiative to ensure humanitarian access and an end to the violence. UN Secretary General Antonio Guterres also urged Myanmar to "end the military operations" and "address the grievances of the Rohingyas, whose status has been left unresolved for far too long". Turkish President Recep Tayyip Erdogan called on the international community to act on the crisis warning that "unless the tragedy taking place in Myanmar is brought to a halt, humanity will have to live with the shame of another dark stain in its history". What sparked latest violence in Rakhine? A spokesperson for the EU said Ms Suu Kyi's invitation for international diplomats to visit the affected areas - previously ruled out of bounds by the government - was "a step forward". 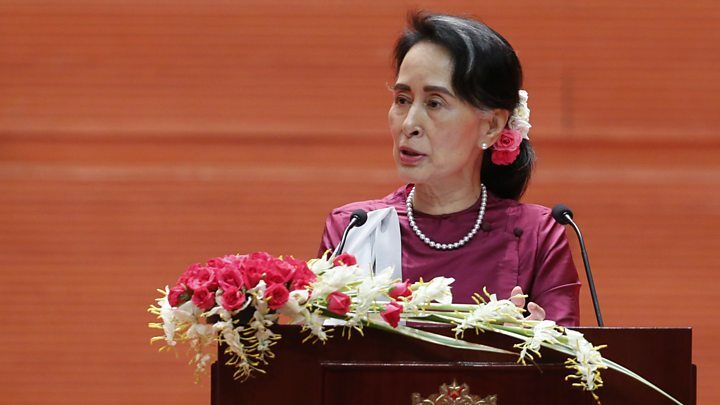 But he said Myanmar's leadership needed to show "that the democracy they fought so hard for can work for all the people of Myanmar, beyond ethnic, social and religious boundaries". UK Prime Minister Theresa May also said the military action in Rakhine had to stop. The UK is suspending training courses for the Myanmar military in light of the violence. Amnesty International said Aung San Suu Kyi's speech was "little more than a mix of untruths and victim blaming", and accused her of "burying her head in the sand" by ignoring the abuses by the army. Having led Myanmar's struggle out of decades of military dictatorship, Ms Suu Kyi received the Nobel Peace Prize in 1990. She remains overwhelmingly popular in the country. One of her most senior ministers defended her speech and sought to clarify some of the questions it raised. Ms Suu Kyi had said she did not know why people were fleeing, but social welfare minister Win Myat Aye told the BBC that the Rohingya who had gone to Bangladesh all came from communities which supported militants and that they had left to avoid interrogation. 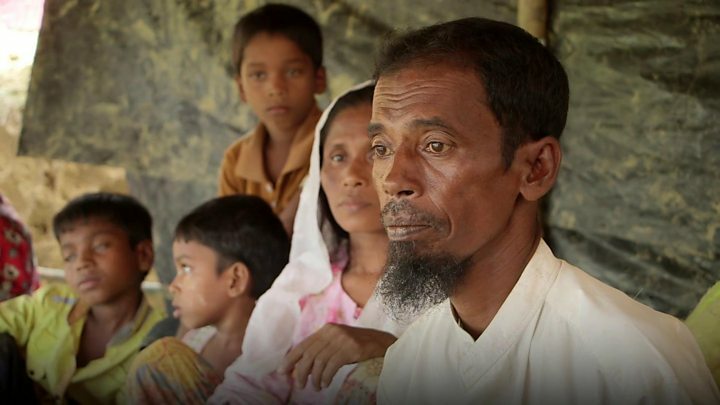 The BBC's Jonah Fisher says this version of events is directly at odds with what many of the Rohingya who have arrived in Bangladesh are saying. Rohingya crisis: Are Suu Kyi's Rohingya claims correct?